Jeff Nitz T’14 saw his first rocket propelled grenade launcher on the streets of Abidjan, Côte d’Ivoire, last winter. “It was just a group of guys in the back of an F-150 pickup truck, driving down the road,” he says. By this time he’d gotten used to seeing soldiers at checkpoints carrying AK-47s, barely giving them a glance. For decades, Côte d’Ivoire had been known as the “Paris of West Africa.” A collapse of its economy in the 1980s was followed by ethnic strife, a military coup, and a civil war that ended only a few years ago in an uneasy peace. He found that opportunity through the Tuck Global Consultancy (TGC), a second-year elective course that provides students with valuable international exposure through real-world consulting work for a host of worldwide clients. 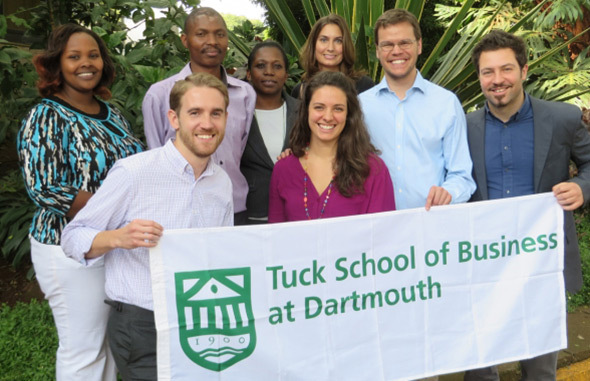 Since 1997, Tuck Global Consultancy teams have completed more than 180 projects in 55 countries and have worked with some of the world’s biggest brands, including Citibank, Home Depot, Microsoft, and Unilever. From the beginning, this project was different. “It was the most complex engagement we’ve ever tried,” says TGC director Kerry Laufer. “The scale and geographic footprint were unprecedented.” Rather than working with a corporate client, Tuck would be engaging with Global Alliance for Improved Nutrition (GAIN), a Geneva-based international development nonprofit. And instead of working in a single country, student teams would be working at five sites in four different countries—Côte D’Ivoire, South Africa, Kenya, and India—in an effort to evaluate GAIN’s nutrition programs.